Those sails look absolutely stunning. That's a sharp set of sails. I just realized as I write this that I am posting to an older thread but I'll go ahead and add my experience FWIW. I am a Hobie 16 sailor, but I suppose it's still relevant to 18s. I went through this debate with myself several years ago. I ended up buying a set of Whirlwind Super R square top dacron sails. I have been very happy. I saw a friends mylar sails flake apart and once that started it was like rust on a car - you can't stop it. It just looked like a pain to take care of, and I don't race much. I also think the Hobie 16-18s are made for dacron - just my sense of it. I like colors, too. (I built that color picker widget for Chip's website). 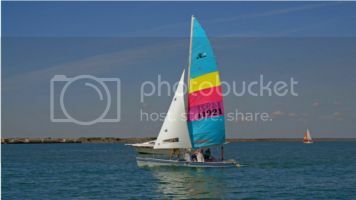 In fact, the first H16 image on the Whirlwind website gallery right now is my boat - the one with orange, blue and white sails. My colors have not faded that I notice and I sail a lot in the summer. I heard opinions and analyses on square tops for these boats, but I don't care I like it. I do feel that I get some extra power. My hull is out of the water in a little lighter air. It twists off and doesn't overpower on a broad reach. I have to disclose that I also got the carbon battens and I think that might help with sail shape too. My boat is definitely a little faster than stock boats around me, though if people want to think it's my sailing ability I don't disabuse them of that. A couple adjustments I had to make: the center of weight moves back with the square top, so I stand my mast up a bit straighter than before and I had to adjust the rudder rake a little to moderate tiller tug. I also got a 6:1 downhaul. Thanks for the feedback, and nice sails! I haven't made any purchases yet, but I'm leaning towards a classic set of sails. I figure a new pair of sails is a big improvement over my 30 year old sails, even if my sails only have about 5-10 years of use on them. I like the classic sails because they should be the same as the standard H18 sails, so if I beat another H18 (or an F18), I know that my sails aren't the ONLY/primary reason, lol It's just nice to have a "clean" baseline. And they're a decent price. Sure, the EPO's, solid mast and 5:1 downhaul probably have a slight performance improvement associated with them, but those are (or were at one point) class legal. If I stick to the original sail shape, so are the sails (not technically, but in theory it's still the same boat and same sail shape). I've been plenty happy with the performance of the boat under the classic sails. Square top sails would be a nice little performance boost, and I know the laminate sails hold their shape MUCH better than dacron in puffs due to their lack of stretch, but from what I hear they don't last near as long as the dacron sails, and I don't really want to need to replace my sails every few seasons. Besides for the cost of the Super R, I could pick up a classic main & jib, and a spinnaker! it sounds like you're on the right train of thought for your considerations. As you busy yourself thinking about the fastest colors, you could also talk to Chip about how different types of battens may affect the shape of your main and power. I don't know if there is only one class legal type. I think the epoxy battens are more bendy but they may not be worth the effort. I have a running thread over at Beachcats... mostly my thoughts and feedback over the last year. Quick summary: 3-seasons old Whirlwind Pentex tri-radial squarehead sails are WAY BETTER than decades-old Hobie horizontal-cut dacron sails. No surprise, right? I also don't race -- I just like sailing. I am impressed by how much more control over sail shape I have with these sails. Sheet, outhaul, and downhaul all have visible and trimming has immediate effects in good wind. Acceleration is wonderfully immediate in gusts... and it is well worth rigging up even if the wind only blows 6-7 mph, which really opens my sailing season up.